Rating: 7.0/10. From 5 votes. Summary: The description, specs, photo, pricing and user ratings for the Charter Arms The Chic Lady revolver. Charter Arms‘ has announced a new model in its Undercover Lite revolver line, The Chic Lady. 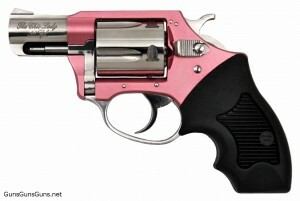 This gun is a five-shot, .38 Special revolver is built on a 7075 aircraft-grade, pink anodized aluminum frame with a 2″ stainless steel barrel and cylinder. The stainless steel parts feature a high-polish finish. This pistol wears a rubber grip (a Crimson Trace Lasergrip is optional). To acquire an accurate sight picture, it carries a serrated front sight. It also features a hammer-blocked safety system ensuring the revolver cannot fire unless the trigger is held in the full rear position when the hammer falls. The Chic Lady comes in a faux alligator pink attaché case with high-polish stainless steel trim. .38 Special, .38 Special +P 5 2″ 13 oz. This entry was posted in .38 Special, .38 Special +P, $251-$500, Charter Arms, Compact, Full size, Revolver on October 19, 2010 by Staff.